Phoenix – February 6, 2018 – Discovery Creemos Academy, a charter school which closed last week, should never have been allowed to open this year. If we had proper financial accountability it would have been closed well before the 2017-18 school year began. What happened at Discovey Creemos could happen at other charter schools in Arizona due to lax state law. So far the legislature has prioritized who blow dries hair over legislation to improve oversight and accountability of more than $1 billion annually allocated to charter schools for educating our children. Meanwhile, the former CFO of Scottsdale Unified School District is currently under investigation for self-dealing and fraud. She could face criminal charters for her actions. Yet the more egregious transactions by Discovery Creemos Academy’s charter holder remains legal under state law. In our report issued in September, the Grand Canyon Institute noted that three-fourths of charter schools were engaged in questionable related-party self-dealing that did not save taxpayer dollars, involving close to half a billion dollars. As a forthcoming Grand Canyon Institute report will note, one-third of charter schools in Arizona are engaged in self-dealing and have had multiple years of net losses—which in some cases is already leading to negative net assets. Discovery Creemos Academy had known financial issues dating back four years. Two years ago their net assets topped a negative three million dollars (Net Assets are the difference between Assets and Liabilities). They clearly were not on a sustainable financial path and did not pass the Arizona State Board for Charter School’s financial dashboard. 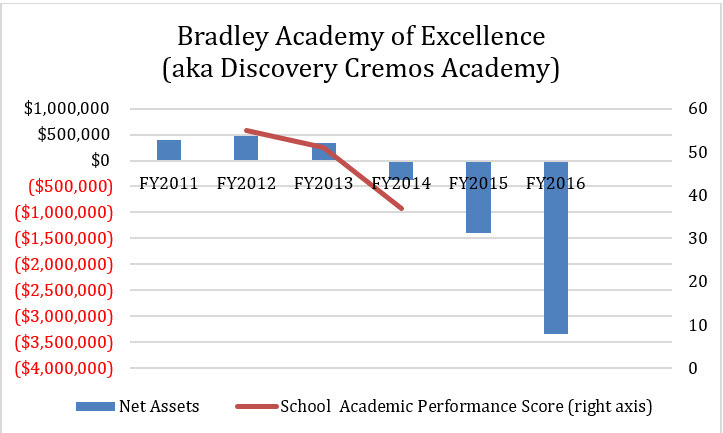 The school’s academic performance had already fallen from a C to a D in FY2014, their first year of negative net assets…and in the most recent letter grades the school received an F for academic performance. The school’s charter holder had created numerous self-dealing operations (all legal under Arizona state charter school law) where the school contracted directly with private companies owned and operated by himself and his wife. In FY2016, the couple purchased undesignated supplies for the school worth more than half a million dollars from their companies. Nearly another half a million dollars that’s not well accounted for may have been a personal slush fund for the charter holder—and may constitute fraud. That was referred in October 2017 by the charter board to the attorney general—But the issue should have been known from the FY2016 audit at least one year earlier. The school received about $2 million of $3.4 million it was due to receive from the General Fund, including a payment through February. Children, parents and teachers deserve to be financially protected. Subject charter schools to the same procurement practices as District schools—so they can’t make sweetheart deals with their own for-profit companies. 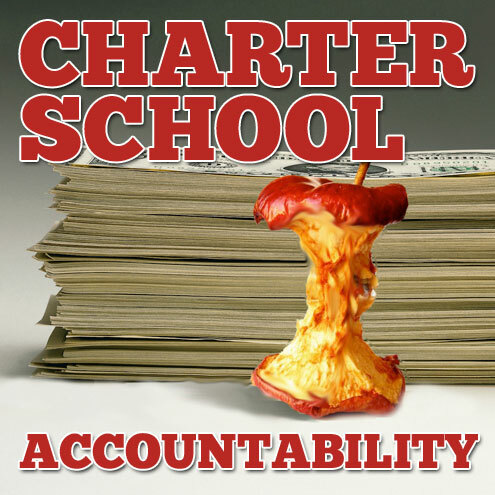 Empower the Arizona State Board for Charter Schools with the ability to close down financially problematic schools. Re-examine whether charter school board members should be allowed to have financial interests in the charter school they oversee. To read GCI’s Sept. 2017 report on charter school financial practices in Arizona click here. Grand Canyon Institute to support our continuing work. GCI, a 501(c) (3) nonprofit organization, is a centrist think tank led by a bipartisan group of former state lawmakers, economists, community leaders and academicians. Founded in 2011, GCI serves as an independent voice reflecting a pragmatic approach to addressing economic, fiscal, budgetary and taxation issues confronting Arizona.